Photo credit - Andres Burgos. This came out first as a visual in my head. I spent a few hours in a jail cell after being robbed and having an altercation with my thief. The authorities took me in to testify. Maybe they thought I started it. But in that moment I had so many things go through my mind. I was on a visa, so that was very scary… I didn’t want to have a problem with that, and at the same time I was an actor and a writer. Any experience like this is gold. There were two people in there with me. They were a few cells away from me but we could still hear each other and we started a conversation. There was a red headed older woman who had grabbed another woman’s hair on the bus and a mysterious homeless man that I didn’t know much about. Long story short, I ended up singing “At Last” by Etta James to them. They were so into it and wanted me to sing more but of course a police officer came in and took the fun out of it, telling me to stop or I would spend the night there. After this, I saw the film Un Chant D’Amour by Jean Genet and felt very inspired. Loving someone through a wall… loving someone when you’re not "supposed to”. It felt very close to home and it also felt like a good metaphor for how we interact with other people. We don't see much of their faces anymore. About a year after, I was on the piano writing music and the chords for bad influence came. As I started singing it, the jail images came to mind and that’s when they both married into one piece. Inspired by classic greaser imagery, the many incarnations of Catwoman, the Wachowskis' Bound, a night spent in jail, and, primarily, Jean Genet's classic queer film Un Chant d'Amor, “Bad Influence” is the first major music video to be released by groundbreaking artist Baby Yors (formerly known as RESH). Shot over 3 days in and around New York City, the video, co-directed by Baby and Sergio Allard, is the high-fashion, high-stakes, and bittersweet accompaniment to the artist's latest single, a mid-tempo jam that reflects Baby's theatrical flair as well as his Latin roots. It stars Baby (born Marco Palou) and actor Peter Forde as two friends and possible lovers who commit the perfect crime, then yearn for what they may have had in the confines of a smoky prison. Additional prisoners dance like ghosts in sordid flashes, and a voyeuristic guard (also played by Baby) scans the scene with a watchful eye. Throughout, the action flashes back to a robbery (which co-stars America's Next Top Model contestant Khrystyana), and also to a safe house, where hundreds of bills fill the frame as the thieves enjoy brief victory. As the events reach their climax, the video ultimately asserts itself as a moody love letter to cinema, male relationships, ill-conceived dreams, and the influences that steer some of our most fateful choices. Mixing timeless cool and androgynous chic, the video for “Bad Influence” was styled by Brandon Garr, and it features looks from Gucci, The Blonds, Zana Bayne, and rising designer Oscar Chen. It was shot by D.P. Ignacio Walker, and its prison set was built by production designer Z. Behl, who previously worked on the Oscar favorite <Beasts of the Southern Wild.> Its additional cast members include violinist Aaron Bos, dancers Patrick Minor and Javi Perez, and nightlife heartthrob Vinny Vega, among others. The video was edited, produced, and creative directed by Baby, in collaboration with Perfect Fit Brand and Prose Productions. 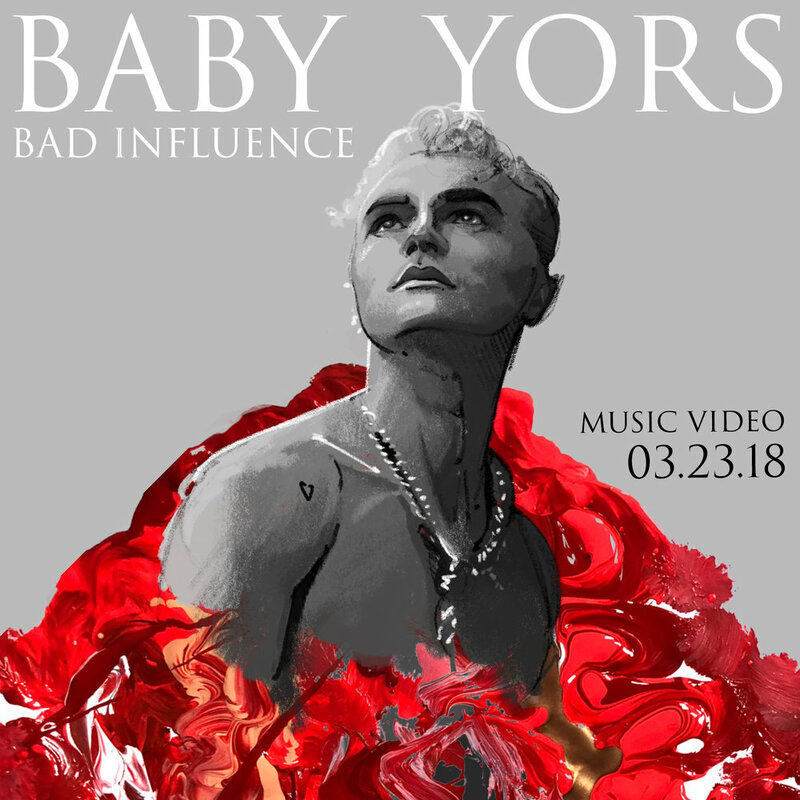 “BAD INFLUENCE" is a triumphant slice of rock-pop exploration that presents BABY YORS as a rare artist who can address the temperature of his turbulent experience while also providing euphoric musical escapism and a theatricality that’s much needed and missed in today’s pop scene. Produced by Sahil Ansari and Zenif, “BAD INFLUENCE”, like Baby’s recent single “New York”, serves as a document of one of the most creative artists to emerge from New York's immensely fertile landscape – and one who has been thriving in the underground scene for years, bringing his electric performances to venues like Le Poisson Rouge, Pianos, Arlene’s Grocery, The Knitting Factory, and more. Also connected to Hollywood, BABY has acted in several major film and TV projects (including The Good Fight and The Carrie Diaries), and his flair for the cinematic is embedded in his work as a musician and a consummate creative. His loyal fanbase and active social media presence has yielded him an ever-growing audience, who’s been invited to watch his evolution as a vanguard performer. Also on his way to becoming a new fashion icon, with a compelling, androgynous style and vibrant aesthetic, BABY is proving that his music is a gateway to a multitalented figure - and a force to be reckoned with.